Silver presale part 1 and a silver giveaway! Anyway, as we start slowly gearing up for the holidays we have lots of things coming in. So many exciting things going on behind the scenes. We are getting in two silver shipments, one in 2 weeks and then the other will follow about a week later. 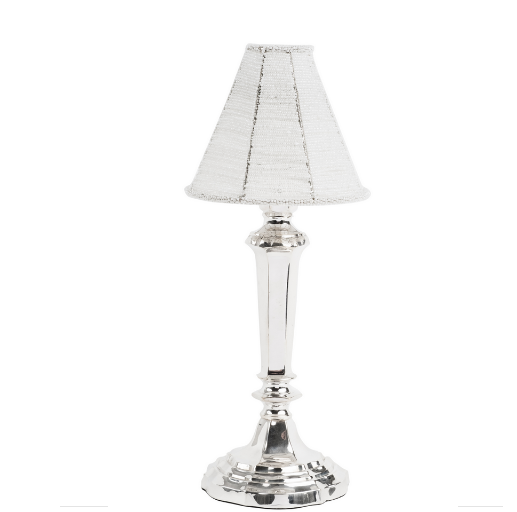 We are getting in another big shipment of our ultra popular silver mini table lamps, all chargers are coming back, some new planters/beverage holders, tons of mint juleps and serving pieces. 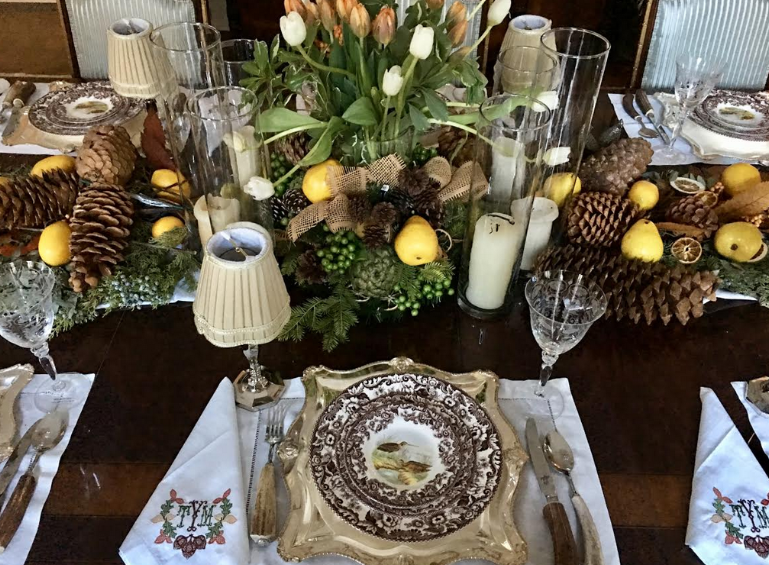 We have you covered for all your entertaining needs this holiday season (can’t believe it is not really that far away) and this is a perfect time to secure your order as many of these things will be sold out before they get here. ITEM 1 These has been a runaway success. A little story as to how they came to be- These were created when I could not find them, but admired them when I had been in beautiful restaurants in France and then in the Polo Bar. I just had to have them! So started my journey of designing and creating them! These are simple exquisite, super high quality silverplate and heavy, beautiful quality! They come with their fitted beaded shade which has special clip that attaches to the glass votive (included). Just put a votive candle in and you are on your way to one exquisite table! I love using them at each place setting, it looks so intimate. Perfect for a holiday table….any time any where. These are normally $52 and $55. ITEM 2. Silver chargers. Everyone loves them and every table needs them. Talk about a way to totally and easily elevate any table setting. 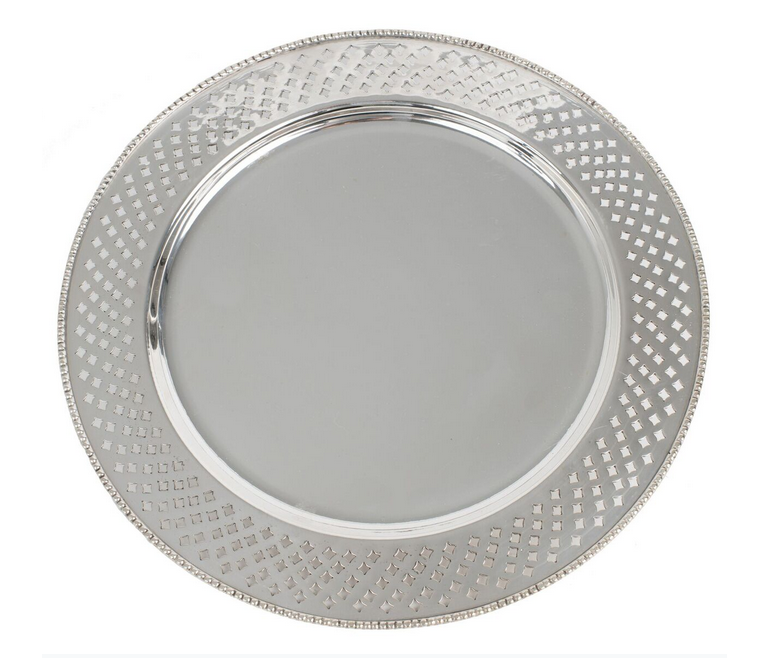 A silver charger adds instant elegance and sparkle to any table. Offered in three incredible styles, all are coming back. I love that they are a neutral and go with any color/style china. 2A. Round pierced charger 14″ round, incredible attention to detailing. You just don’t see this much anymore. Fabulous pierced charger, will add such beauty to any china it is paired with! 2B. 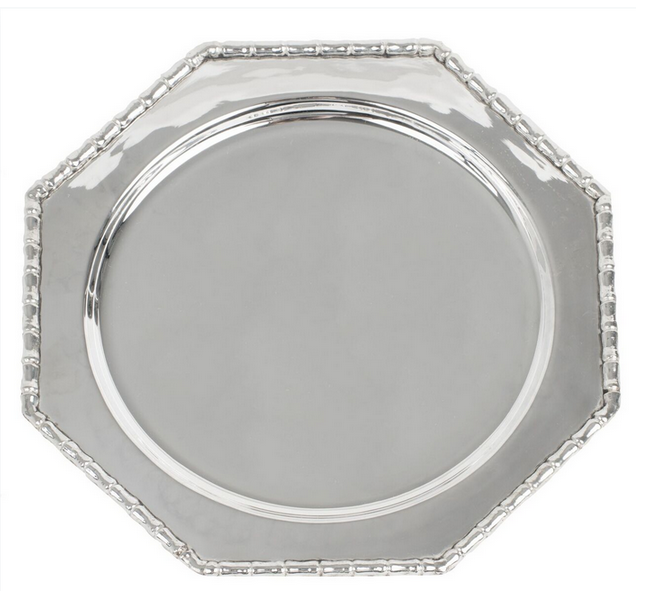 The beautiful scalloped lions head square charger measures 14″ square. Fabulous shape and elegant design make this a showstopper. ITEM 4. And this best selling fabulous large planter/wine tub is final coming back. Just gorgeous with elegant etch work and a beautiful scalloped shape. I have used this as the most elegant wine cooler and also filled it with orchids and the effect either way is so beautiful. 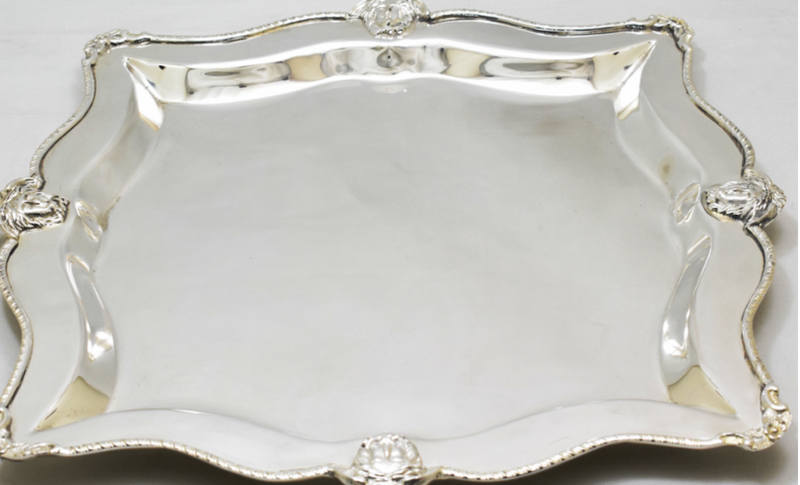 Doubles as an exquisite beverage holder for wines, drinks, etc…..
One lucky winner will win this gorgeous silver tray. Perfect for a vanity. All you need to do is leave a comment here telling us your favorite item and how you would use it. I will announce the winner on Sunday so be sure to check back. If you see a pretty something calling your name, simple email or call us to place your order. Lots to love here and can I say, this kind of gets me excited about planning out my fall and holiday tables:) Part 2 of the presale will be posted in about 2 weeks which will include some more planters, a tiered server and plenty of mint juleps. Does this get you just even a little teeny tiny bit excited to start decorating a holiday or fall table? 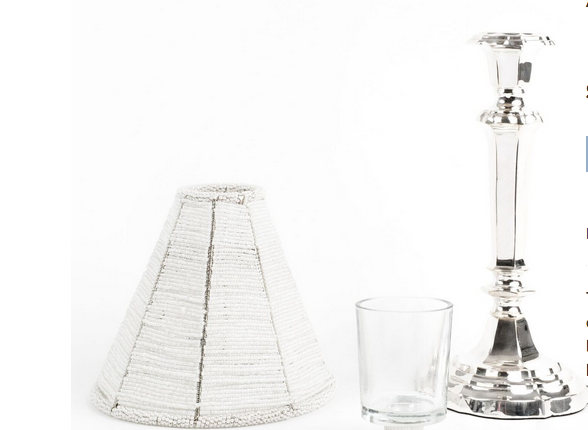 Something about silver and a beautifully set table go together so seamlessly. Thanks for stopping by, wishing you a fabulous day. until next time…….. I love the hexagonal bamboo chargers! Would use them with my Fitz and Floyd Dragoncrest china circa 1979! I would use the small planter as a wine bucket and during Christmas I would put poinsettia’s in it. It’s a toss up between the lamps and the chargers!! I already ordered the chargers but I have been eyeing up those lamps for a long time, beautiful for setting my Christmas table!! I love the beautiful silver planter. I would use it in a guest bathroom with white hand towels rolled up in it. It would also be beautiful planted with white orchids. No 4. I have the perfect hall French style table for it filled with orchids. It would be beautiful! I love the small planter and would use with a very full white orchid plant. Gorgeous! The large punch bowl is simply beautiful and so elegant. Can’t get enough silver in my life! With lots of fall entertaining events coming up the tray would be a great addition on my bar cart holding glasses, especially the after dinner drink snifters! The bamboo chargers are so perfect! I love the table mini lamps with candles! Everything is so pretty! The bamboo chargers are so perfect! And would use with my older Wedgewood china. I think no. 4 is perfect for keeping wine chilled for holiday dinners! I can see that elevating my dinner table to a new level of hospitality! 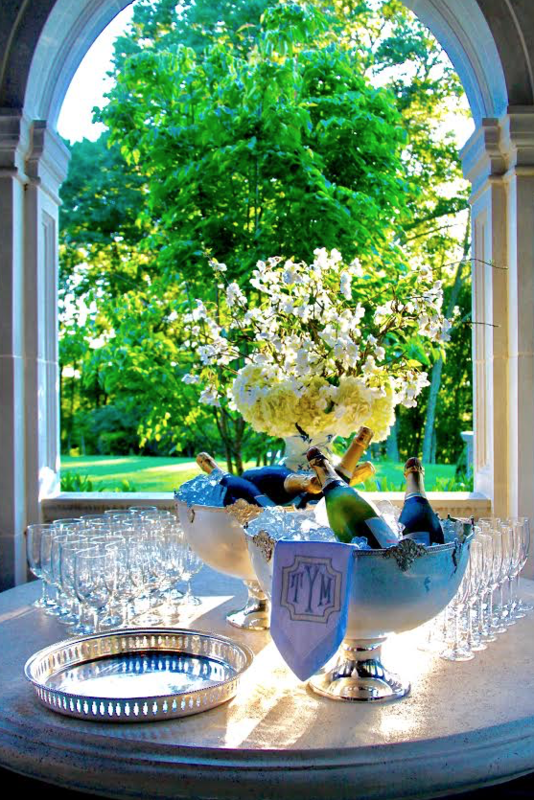 If I had the silver ice bucket, I would use it just as displayed…..it’s perfect lovely! Nice big ice chunks, with a couple of bottles of champagne or Rose! Your displays and settings are stunning and I am totally inspired by them! I like the punch bowl. Would use it to store wine in. Love everything! Especially the chargers. Could use the chargers not only on the dining room table but also behind blue and white ginger jars on shelves or on a easel. Would provide a great accent! The beautiful silver punch bowl has multiple uses, but I can see it on my dining room table filled with red roses at Christmas. Um, did I just say Christmas? It’s August! But it will be here before we know it! Love all your things, Tina! I wish I could have every piece of silver that you are offering!!!! It would only enhance my table. 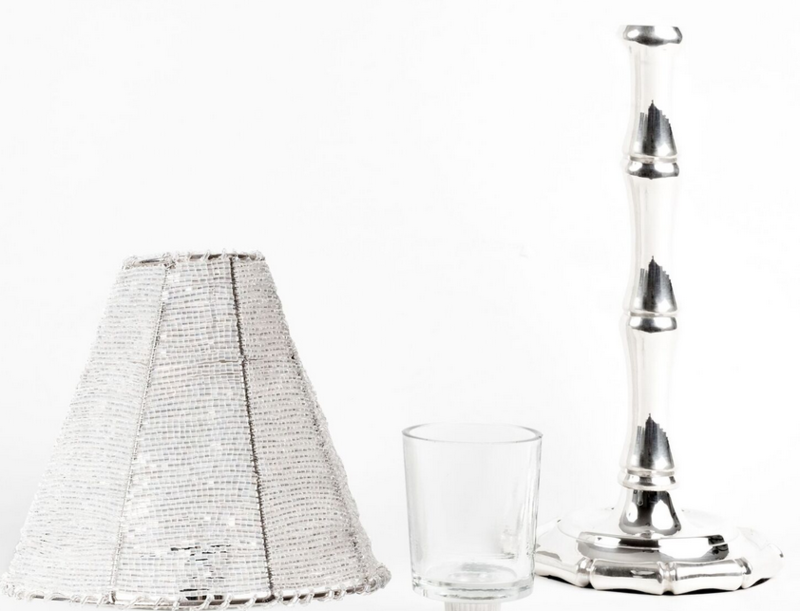 Have to say that it’s a toss-up between the silver bamboo charger and the silver bamboo votive lamp. The chargers are perfect for gracing my holiday table but would also use (with paper leaves) for cheese and hors d’oeuvres servers. At least one lamp would end up on the vanity in my powder room. Love that the beaded shade is included. We recently hung “French” inspired small corbel shelves on either side of our archway, I’m thinking the gorgeous scalloped candleholders with shades would look perfect on them!! Also craving the small silver planter, so pretty! I absolutely love the large serving/punch bowl. I would actually put fruit in it and display it on my kitchen island. Love the Lamps. Used in so many fine restaurants espically in Europe. Dresses up,any table. I would covet the bamboo table lamps and use them for romantic dinner’s.. Like you, I’ve always wanted to recreate the fine dining experiences I’ve had in Europe, NYC and DC. The lamps and silver chargers are absolutely beautiful and would add so much to a table setting. I adore the scalloped lions head chargers. They are so unique and none of my friends have these! I need these in my life! They’d go beautifully with my china. I love #3 , when not being used to serve shrimp or beverage, I would fill with small beautifully wrapped Christmas gifts. The lamps are my favorite, beautiful and a classic, fits in any decor, dinner table, foyer, on top of a mantle, and many other places around the house!!! I love the bamboo lanterns and beaded shades…Planning a wedding and they would be a perfect addition to the tables….such lovely muted light! The bamboo chargers are perfect! They would make holiday dinners so much more elegant! Everything is so Beautiful no matter where you could use it! I love it all and it can and would be used for all Seasons! I love the scalloped lamps and would use them for everything. So versatile. Change the shades and they are less formal, etc. Beautiful ! Seriously, l love each and every piece in your silver sale! Silver is a beautiful addition to any home! Thanks for always inspiring us! The square chargers are to die for! Love the votive lamps! I would use these for an intimate dinner party for 2. I love the candle lamps and would use them anytime the mood would strick me. The hexagonal charger with the textured edging is my favorite. I would love to use these with my few pieces of blue and white. I’d also like to use them in my guest bedrooms to place a small bouquet of flowers on. 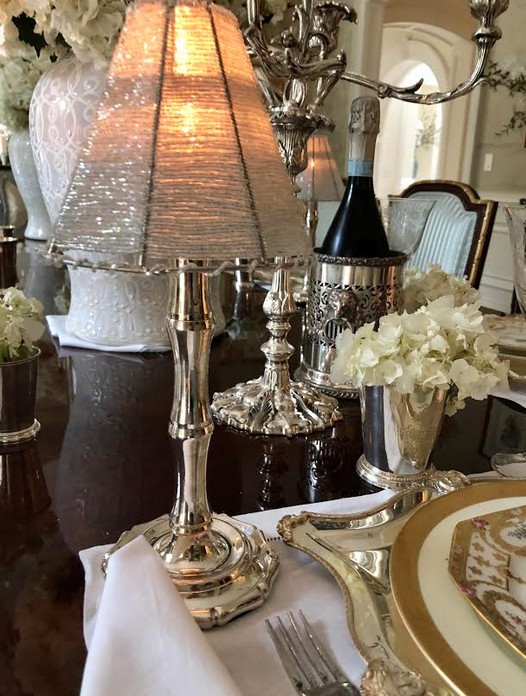 Absolutely love the silver lamps – will definitely use them on our holiday tables & throughout the year, especially for cozy dinners. Love it all …the tray is just fabulous! Silver is timeless and one can always find places in the home to use it. I love the scalloped mini lamps. They would add a soft glow at any table, especially during the holidays. the votive lamps and chargers in bamboo are my favorites. What a beautiful statement they make on a table! Fill it with beautiful glass ornaments for the Holidays! Love the bamboo votive lamps and the small ornate planter. And everything else! 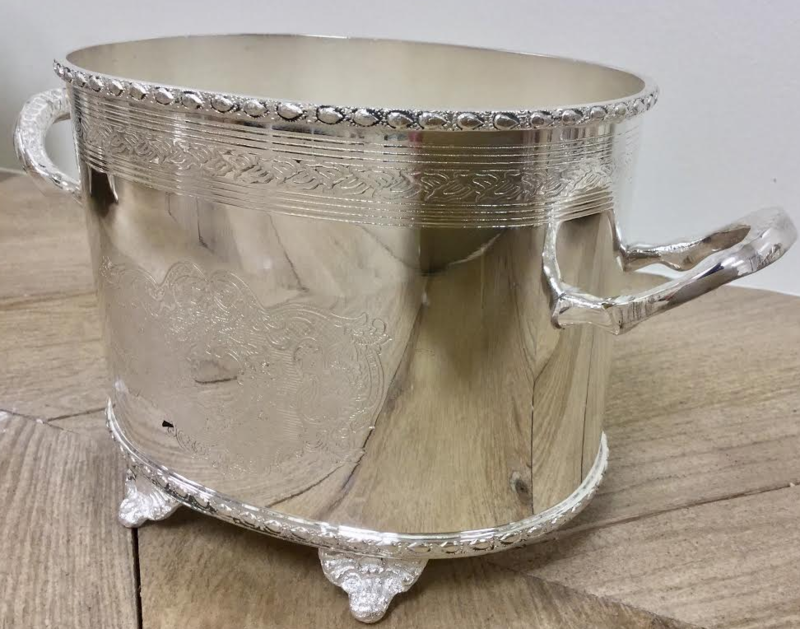 all fabulous additions to your already great selection of elegant silver items….ordered a Very Large Silver Tray last week and can’t wait to get it…Where can I send you a photo to add to your Boxwood Pictures…Have a gorgeous one you should see! Love the bamboo chargers. Would use them under my Thanksgiving turkey dishes. The chargers make any table look wonderful. I love the scalloped table lamps!! Have to have them! Love the large punch bow. So charming and current. I love all of the chargers, can’t decide which one is my favorite! I also love the candle lamps, they take me back to a time of classic elegance. I know you are a “silver” lover, but would love to be able to purchase mini lamps in a gold or brass finish. Please consider looking into this request. Any other gold lovers out there who I dying for these beautiful mini lamps in gold or brass finish? I hope so! I would set my dinner table in blue and white linens and ginger jars with the silver bamboo chargers. They could also be hung on the wall to create a mirror effect or used as serving trays. Must have them!! Love the scalloped edges of planter, item 4. Very beautiful! I love the bamboo chargers. My China is Wedgewood Kutani Crane and the look would go beautifully together! The little lamps are just so charming! Love it all, but am thinking I need those lovely bamboo table lamps. They add a lovely formality to a table setting which is so often missing these days. I love the silver tray and the punch/serving bowl. All very beautiful. Every piece is so elegant and versatile. Thank you for providing us with classic accessories at great prices! Your silver selection is just lovely! I love the elegance of silver (I play a sterling silver flute!) Your NYC design project is coming along so beautifully! Every piece is fabulous, but love the chargers! The mini lamps! would use them in other spots too -like the kitchen counter or powder room! I love all your silver, especially the square chargers, I love that shape. Thanks for a great blog! I love the lamps, and I have a lovely antique table in my foyer that would be perfect for the lamp! I would use the beautiful little lights on my patio, and also put one in my master bath . The square chargers are a must for my holiday dinners! I love your tea lights and any of the silver that has the pierced edge! Thank you, Tina for all the beauty you bring to us! Love the large punch bowl which is so versatile! I like the silver planters which I would use to accessorize a guest bath. I love the lamps! I can see them on my dining table, coffee table with appetizers, and many other places!! I am ordering the square chargers to use at my fundraising luncheon next winter! These will help create an elegant table that will no doubt be memorable! I adore the small planter! It is so versatile and I can think of a million ways to use it! Love all the elegant glitz, but the votive lamps are special! Definitely ready to start decorating. I love your little candle lamps. I have smaller bow front dresser in my dining room. They would be fabulous there or on the table in my foyer. I love silver!! Always have. I love the silver table lamps! I have flameless candles in them in my dining room and they light every evening. Well, each of these items are just beautiful!! I can’t even say which is a favorite!! I want them all, but I think the punch bowl doubles so nicely as a wine cooler, beverage cooler, fruit bowl, or even a beautiful salad bowl, making it a great value and a winner! I love the silver pieces used as planters. So pretty. Item #5 is my choice because l have limited tabletop space and this would be perfect in so many ways, especially for small pots of seasonal flowers, which love to display. 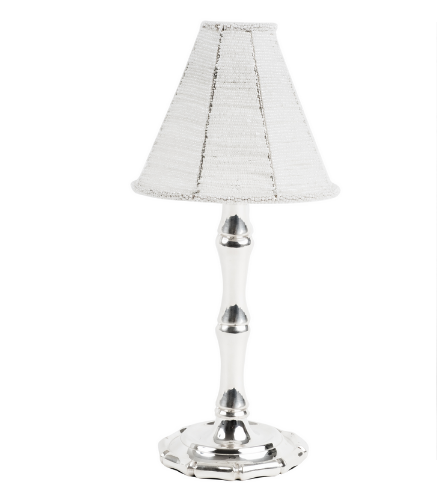 Just love the mini silver table lamps! Perfect for the holidays! I have been a subscribed member of yours for a couple of years now. I get excited when your weekly post reaches my email. You take me on such wondrous adventures through your daily life, I often picture myself riding along with you on one of your trips to the flower market, or brunch with your friends. I remember the time of your trip to Italy last year. I was right there with you. I have taken note of your party planning, food displays, and guests. What wonderful events you have had. (I too was there). I have read everyone of your posts on Palmetto Bluff and your decorating choices. 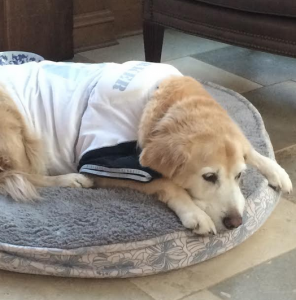 I have seen so many “funny/cute” pictures of your beloved “Teddy”, and I miss seeing him too. All lovely but 1B is my favourite. I have the punch bowl and one of the planters. The planter stays on my coffee table adding such a touch of elegance. I love adding paperwhites to it during the holidays. I adore #3. I bought that one or one similar from TEH a few years ago. I use it quite often filled with ice .. lettuce .. then tons of shrimp! (just as you suggested that when I bought it) Truly beautiful! It is one of my favorites! Hello Tina. I love everything but i can’t wait to order item 5. I want it for an ivy plant for my keeping room. So many beautiful items. Love each and everyone of them. Tina I adore the beautiful votive lamps. I would use them for my Thanksgiving table. I love making each place setting special for each guest. The warmth from the beaded shade sets a comfortable tone. Love the bamboos ! Love all the chargers and the bowls!!! The giveaway tray is marvelous!!!!!! This post has me excited for the holidays, not an easy task as it is 100 today in Texas. Beautiful Silver Tina. Item 5 the planter is my favorite. I would place it on my kitchen island. I am a huge fan of vintage bamboo, especially Chinese burnt. And, blessed to have a few pieces. Therefore, LOVE the darling lamp and chargers too. I love the silver pieces, but especially the lamps. What a gorgeous table! I really would enjoy the silver chargers in either design! They would be the finishing touch to a beautiful table! Think I might have to invest they are gorgeous!!! The large punch bowl is my favorite! I already have one and will probably be ordering another to use in my entry way planted with orchids! Just lovely! Love the table lamps, are the fabric shades available? They are all gorgeous…but the small planter is probably my favorite! Love the idea of putting a poinsettia in it during the holidays! Just love the size and design of the punch bowl. It’s exquisite. I would use it for serving punch with colorful fruits, edible flowers, and possibly sorbet. I also would have everything in the bowl go with the color scheme of my party. When not using it for serving, I would keep it out all year round with a large boxwood in the center or topiary and surround them with beautiful flowers of the season or holiday and drape with different ivy’s and vines. The possibilities are endless and so much fun to create them. Mini table lamps and the chargers! 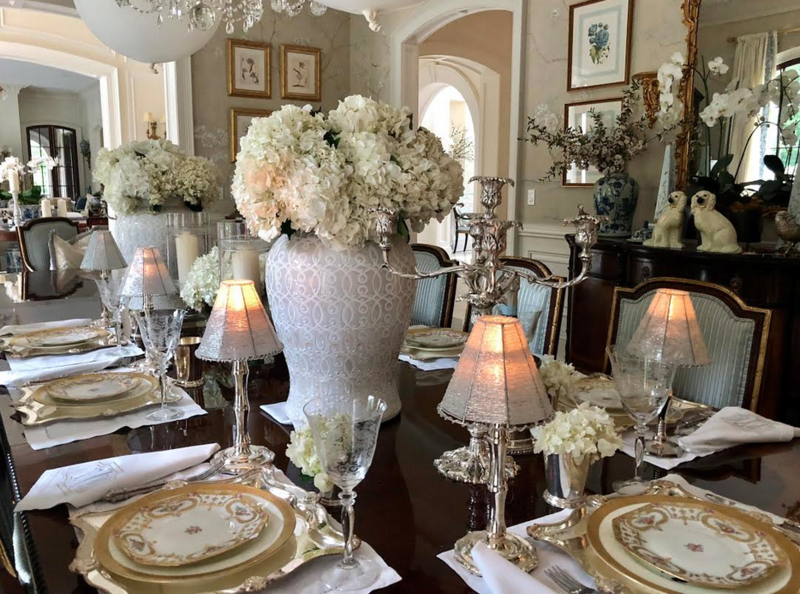 What a beautiful look on in a table setting….just exquisite!! The little lamps are precious. So many ways to use them! Well, that’s easy as punch! It’s just got to be that lovely silver punch bowl. It’s super versatile depending on the weather or occasion. I can see it full of creamy eggnog or with floating islands of clove studded orange slices in mulled red wine at Christmas. 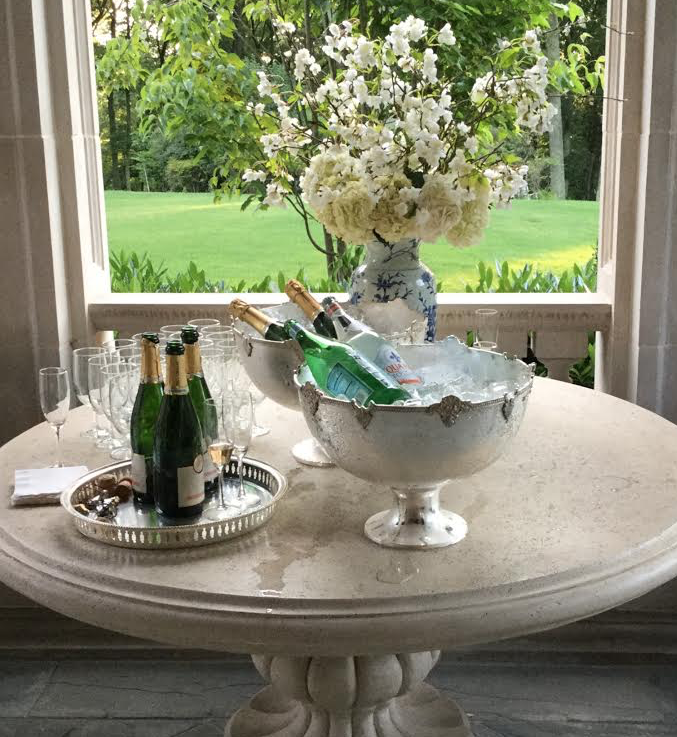 Lovely for the holidays, surrounded by greenery on our mahogany sideboard or at an outdoor event such as a weddings, polo or garden party filled with ice cold punch, champagne or an assorted selection of caviar. All of your lovely silver pieces featured here are a must for hosting this season or to add a touch of charm throughout the year! I love my chargers and plan on getting more as my family grows. I always get compliments when I use them! The silver tray is my favorite. I can think of many uses for it but it would be especially beautiful with perfume bottles on my vanity. Oh, my goodness! So many lovelies, but my favorite are the votive lamps. So classy of you to create them! Perfect for an Autumn dinner down by the lake! All the pieces are lovely, but the punch bowl is my favorite. I love the bamboo table lamps! I just love the table lamps, so elegant! The fabulous silver Punch Bowl! It would be filled with my signature Egg Nog, or bottles of Champagne at all my holiday gatherings. Cheers! I love everything! I would use the tray to roll hand towels. I am crazy for your scalloped lamps and chargers. You have exquisite taste, Tina! I can’t wait to read your Blogs! 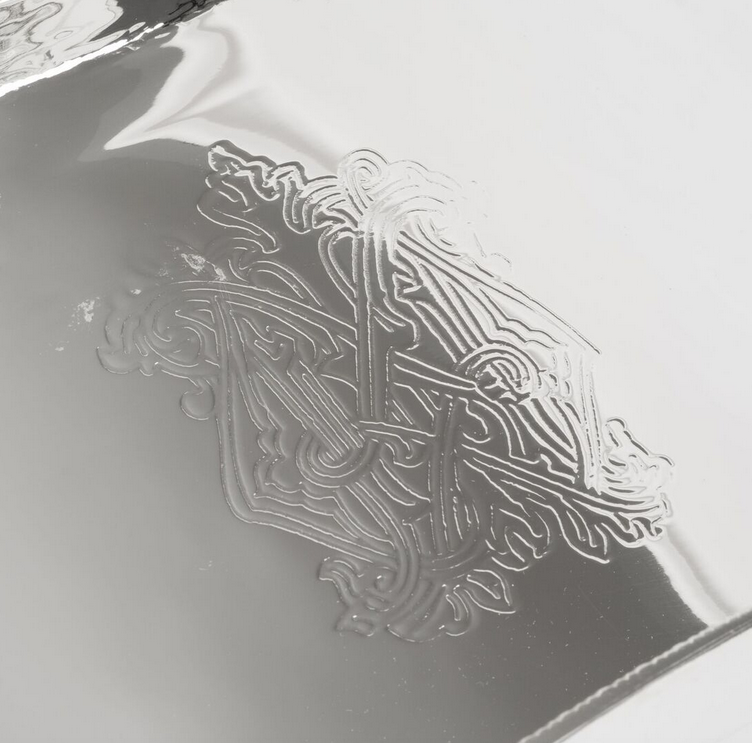 It was a hard decision, but after viewing all the beautiful silver, I selected item 3, the silver punch bowl. It would be so fun to fill it with ice and beverages for any celebration. Thanks for sharing and have a great weekend. So many choices and so many uses for this lovely silver! To buy this time? The chargers! Love the bamboo chargers for the upcoming holiday celebrations! Love Charger 2A! The detail will look beautiful with Polish pottery plates I have for a luncheon I am planning for friends. 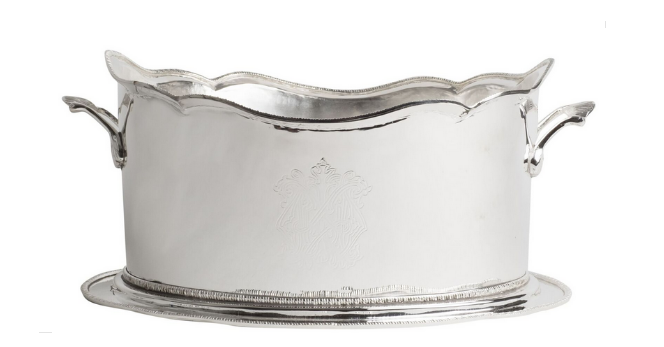 The punch bowl would be perfect for a huge floral arrangement! The small planter is perfect for dried hydrangeas or orchids, and at Christmas piled with shiny ornaments. Love the bamboo beaded shade lamps! It’s hard to choose a favorite here but I’d have to say the candlestick lamps. They are so unique and you don’t see them anywhere else! They’d create a magical dinner in an instant! I love the silver chargers and the table lamps! Gorgeous! 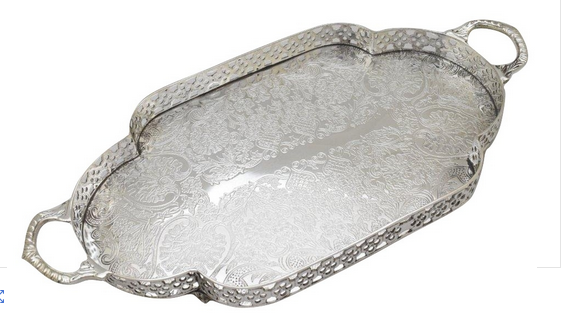 I actually admire the exquisite silver tray because I have long hoped for one. The lamps and beaded shapes are gorgeous and very desirable for placement in several areas. Not ones to be hidden. All the best for your sale. I feel certain they will be gone before one can blink. How beautiful the silver lamps are on your dinner table. I absolutely love item 5! I would use it in my powder room, by placing in orchid in it. It would also look beautiful on my vanity holding my makeup brushes! You always leave me in awe with your beautiful pieces Tina. Have a wonderful day! My favorite is number 4, the large planter/wine tub! I would put it on my dining room table as the centerpiece,and place an heirloom pumpkin inside with done fall foliage around it! But the options are endless! I absolutely love the punch/wine silver piece! Lovely for entertaining and for flowers! I think I’ll get this for an upcoming bridal shower! Love it all, but the mini silver lamps are my favorite. I can see them used in so many ways, like on my daughter’s nightstand or as a pretty vanity accent. Also, the charges you show are octagonal, not hexagonal if the picture is correct. Keep the posts coming! Can’t decide which charger I like best – all beautiful!! The punch bowl Is be perfect for so many things. I would use black filler and place wine bottles in it for Halloween, brown filler and bottles for Wooly Mittens for Thanksgiving and Wassail at Christmas, champagne for NewYears, chocolates for Valentines and dyed eggs at Easter. I don’t know if I can vote again but I will, because I can see two of these lovely items working together. 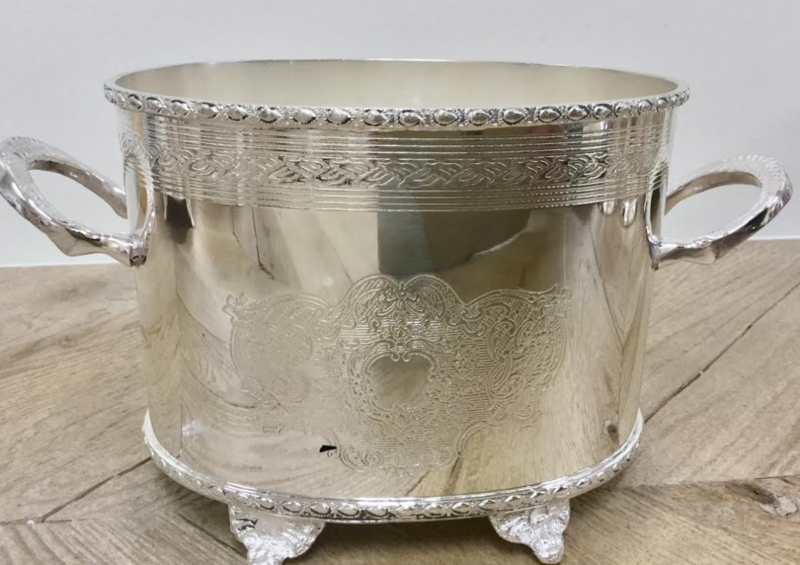 Why not take that beautiful 14″ silver charger and set it on a bed of ice just inside that big shimmering 15.5″ silver punch bowl to serve and ice down wonderful appetizers or desserts to your guests. LOVE the punch bowl! Oh my goodness, it is incredibly elegant! In addition to its intended purpose, I would use it for Southern Strawberry Punch Bowl Cake. I can also see a beautiful arrangement of blush colored roses in it. Beyond gorgeous! My favorite is the bamboo charger. Perfect for any special occasion. Item 4-large planter is my favorite! Would fill it with my antique Christmas ornaments on coffee table! I love the punch bowl it has so many uses: Punch, Ice Container, put rolled hot towels in it for guest’s. Beautiful flower container, and a display for round decorative balls or eggs for Easter or Christmas so many uses!! My favorite is 2B, the lion’s head charger. They look gorgeous on a dinner table, but I would also use one as a small tray on a entrance hall table. I love the 2C bamboo chargers! They would look amazing with my Mottahedah Blue Canton china! I love the pierced chargers! Such a classic piece. I would use it for an upcoming birthday dinner party, everybody deserves luxury for their day. I love the large, silver planter and would put my artificial orchids in it and place it on my dining room table. Not an original idea, but it would look so perfect! Hmmmm….challenging….love it all…. mini table lamp/scalloped detail…. “lighting” the way to a beautiful meal!!!! Love the large planter/wine tub. It can be used for so many things. Beautiful! It’s always tough to pick a favorite! First, I absolutely love 1A (it sounds like everyone else does too)! In addition to the dining table, I would love to use it on a bookshelf and console table. 2B also caught my eye. I love the lion’s head design and the shape would work perfectly with my square plates. Finally, I think the tray is stunning! The overall shape and the detailing on the sides make it special! It’s also very functional. As you mentioned, it’s perfect for a vanity. But I would also love it on my island or coffee table with a special candle, fresh flowers, or anything blue and white! Thank you! 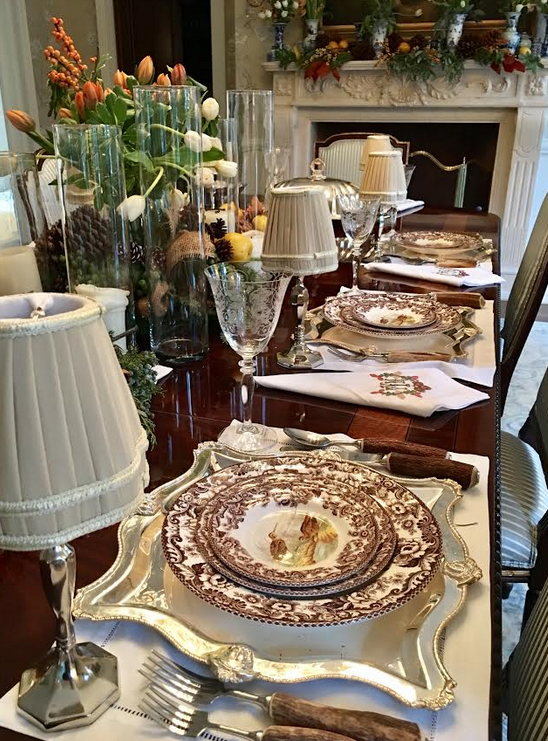 My favorite by far is the scalloped table lamps – the perfect amount of “Wow” for my holiday table! 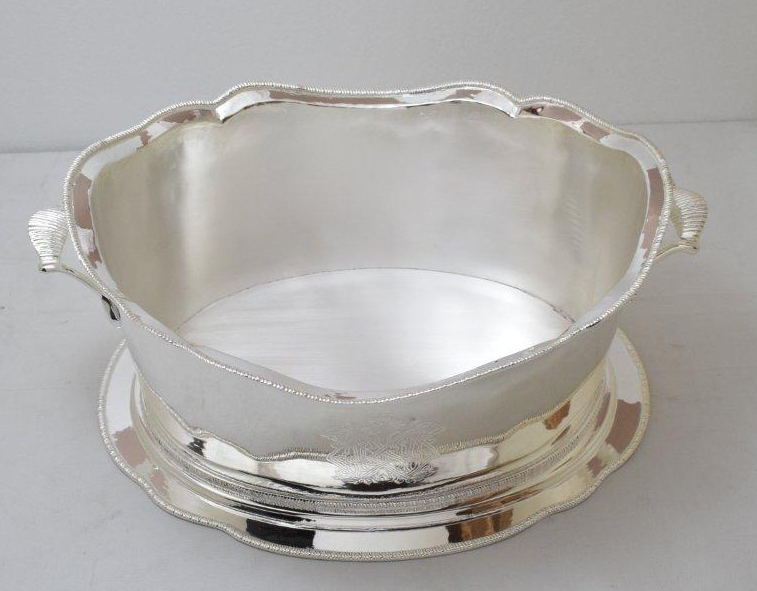 I just love the large serving/punch bowl….perfect for entertaining!!!! It’s stunning!!! The pierced chargers are magnificent. Love them! Love # 3–punch bowl. Would use it for punch or a wine cooler or filled with ornaments or pinecones for the holidays. I have the small planter and use it as a guest towel holder in my restroom. I place the towels on the horizontal and they fit perfectly! So elegant. I love the square chargers and mini table lamps. I would use these for an intimate special dinner party. We are re-decorating our living/dining room and you have given me so many ideas for changing up my table settings. Thank you so much! Easy to answer this one! A perfect wedding gift to go along with the small planter for my beautiful niece, Jaime Munro. Wedding date October 29, 2018! I received a beautiful silver tray for my wedding from my “older” aunt 40 years ago, and it started my love affair with beautiful serving pieces (No red plastic cups please)! I love EVERYTHING, how do I choose just one! 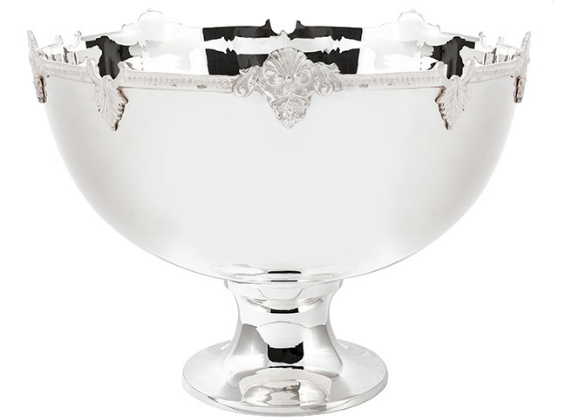 The punch bowl is a classic piece that is needed at every gathering. The scalloped lions head charger and the lamps are also my favorites too!! Love the square chargers. I will use them for thanksgiving! So many beautiful silver pieces, it is hard to choose. 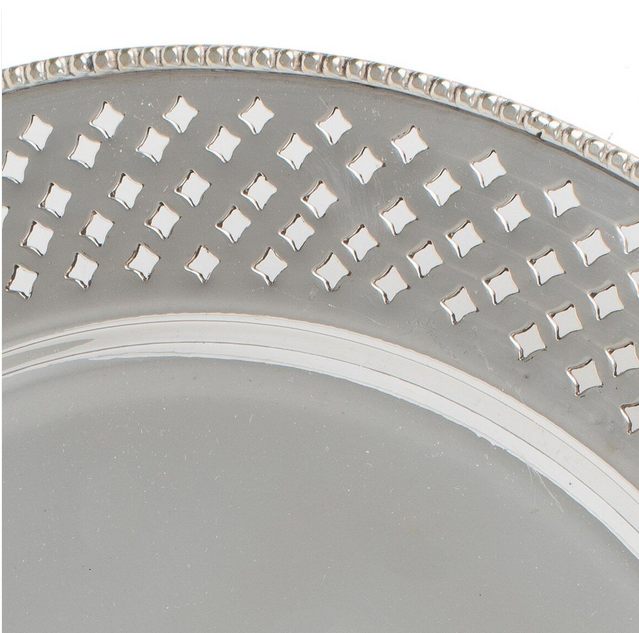 If I must, the beautiful scalloped lions head square charger is absolutely gorgeous! I would of course utilize it as a service plate, also as a butler’s platter to serve hors d’oeuvres, and even as a tray to serve drinks. I love to entertain, so I am certain to come up with more uses. The small silver planter is beautiful and would make amazing centerpieces! I am thrilled to have ordered the table lamps! I will be suing them for an elegant evening in my dining room. I am in Washington State and I am sure I will very unique in having such elegant table lamps. Also the customer service was wonderful when I called today to place my order. Look forward to doing future business. I think the silver punch bowl is beautiful. You can use it for so many occasions. Can’t decide between the square charger or the bamboo….love them!! Can’t decide between the square charger or the bamboo!! I see my Holiday table all set! I love the table lamps. Bar none, the candlesticks and beaded shades are the best! Oh to set such a table. Perfect for a cozy dinner for two with antique Spode China in autumn hues. Love them! I love the small silver planter and I am ordering a pair of them! The handles and the little feet make this silver planter special! I will put orchids in them to display on my dining room sideboard, but I am really excited to use them on my Christmas Buffet table as the perfect containers for dinner rolls and biscuits! I can’t wait to receive them! The bamboo candle lights would enhance our traditional Holiday dinner. Especially fun as we entertain our friends who are alone and far from home over holidays. I like item#5. I think it would look beautiful holding a topiary or faux greenery, and is versatile for any room in the house. 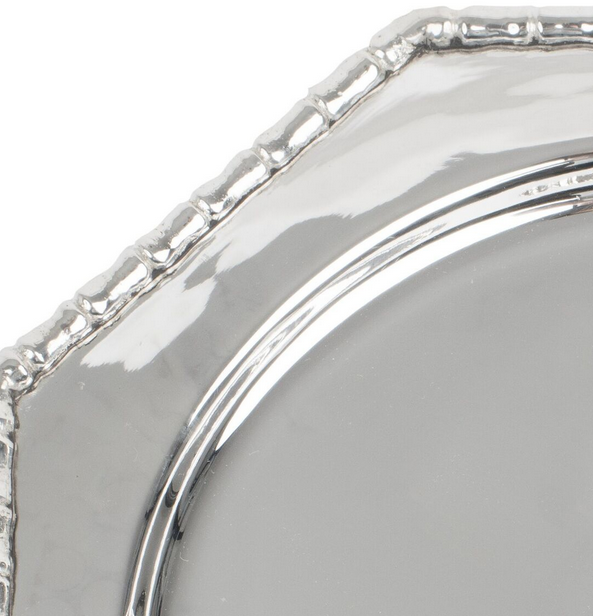 My favourite give-away is the georgeous silver tray. It would look beautiful on my 2-pc vanity counter that is tropical green granite from South America. 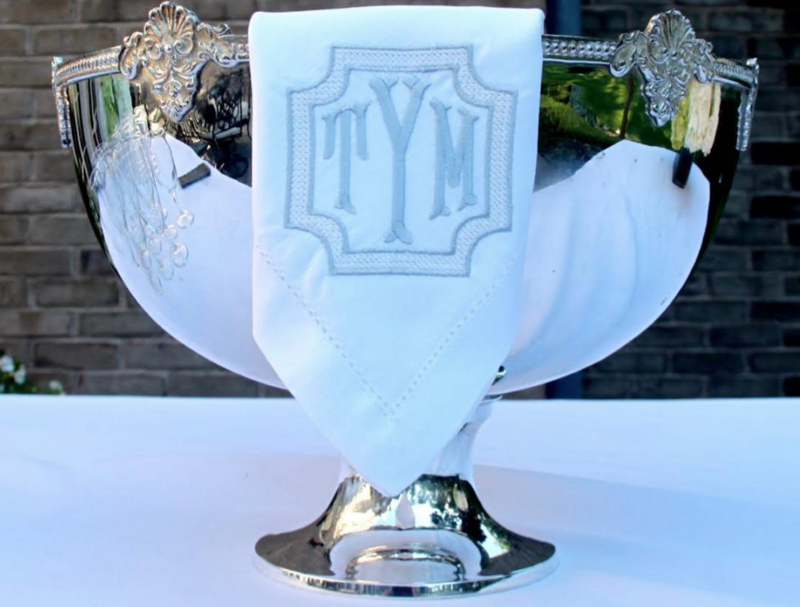 I usually roll up beautiful linen hand towels for special Thanksgiving or Christmas celebrations. My second storey main bath has a gorgeous marble counter set on a very traditional beautiful vanity. The flooring is also marble and gives the room a lovely finished look. I always include other old silver for special occasions and have always loved the look of beautiful towels in a special holder. I have an antique sideboard that has been in my family for many generations. Candles and seasonal decorations . There might be a little competition with it being on the dining table also! Everything displayed is beautiful. But if I had to choose I would choose the silver bamboo charger. It would look lovely under any kind of China or dishware as well as adding that bit of sparkle and shine to any table setting. The gorgeous silver tray is my favorite piece! There are many ways this piece could be used to make your home more interesting and beautiful. As an example, you could place several cut glass decanters with sterling silver labels hanging from them, and then place a set of claret glasses in front. Another nifty way to use this tray would be on a larger vanity with an arrangement of sterling silver mirror, brush, and comb set. In addition, add a cut glass bud vase with fresh flowers, and incorporate a variety of vanity jars with sterling tops for cotton ball, Q-tips, etc. This tray would also be gorgeous placed on a dining room table with flower arrangements in different sized blue and white porcelain jars/vases.